Jenna and Barbara Bush have written an open letter to Sasha and Malia, telling them what to expect in their years at the White House, what they should seek out and what they should avoid. If you're traveling with your parents over Halloween, don't let it stop you from doing what you would normally do. Dress up in some imaginative, elaborate costume (if you are like us a pack of Juicy Fruit and a Vampiress) and trick-or-treat down the plane aisle. If you ever need a hug, go find Ramsey. If you want to talk football, look for Buddy. And, if you just need a smile, look for "Smiley." Go to anything and everything you possibly can: the Kennedy Center for theater, State Dinners, Christmas parties (the White House staff party is our favorite! ), museum openings, arrival ceremonies, and walks around the monuments. Just go. Four years goes by so fast, so absorb it all, enjoy it all! 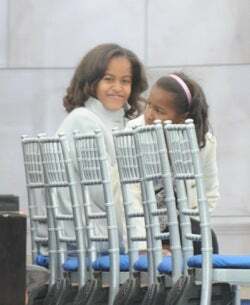 Sasha and Malia are going to grow up in the public eye, facing constant scrutiny and receiving more attention than they are probably ready for. We have only just seen the beginning of this with the media madness surrounding their first day of school. However, this letter is refreshingly not about that. On such an exciting day, it seems right that Jenna and Barbara are cautioning the Obama girls on how to be kids living in the White House, and how to fully enjoy their father’s historic presidency without losing sight of the magic of their surroundings.